When my fiancée and I moved into our house a little less than a year ago, I was super excited about the basement. 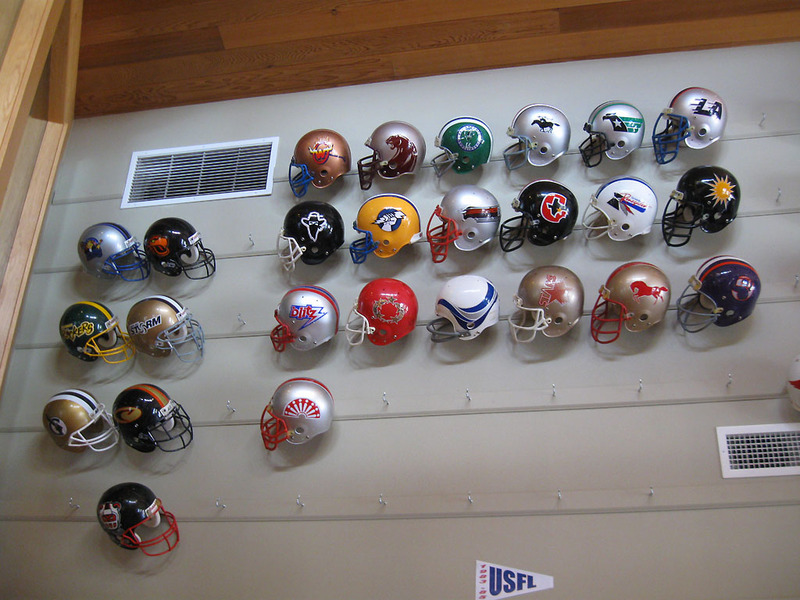 I have quite a few helmets and other assorted memorabilia that I needed to display, and our new house has the finished basement space to accommodate. In fact, when we were house hunting last year, the first thing I needed to see was the basement. In my area, finished basements are quite popular. It is an easy way to add square footage and except in certain areas, flooding is not a problem. The majority of houses we looked at, had some sort of finished, basement, some nicer than others. For me it was just important to have some walls. The first thing you should know about the space, is I don’t refer to it as a Man Cave, I call it the Sports Lair. Which I feel is a better and more appropriate name. In my old place, I had nearly the same amount of space, but the basement wasn’t finished. Sure it had a cool bar that my Grandpa built in the 70s and a pool table, but without actual walls it was going to be tough to display all my stuff, especially, my helmets, which would need shelves to live on if walls were not an option. The only thing dividing my shop and the laundry room from the bar room was some curtains that I covered with flags. it was an okay setup, but it had it’s limitations. Once we were settled in the new place, it was time to tackle the basement. When we moved in, the paneling, that was more than likely installed in the early to mid-eighties, was an ugly brown. Now, we could have ripped it all down and installed drywall, but that would be a lot of work and added money, so instead we decided to paint it. I choose a neutral color, which had the very fitting and appropriate name: Autumn Fog. Once we painted it all it was time to start decorating. Here is what it looked like before, including the old owners stuff. it was drab and boring. Not even close to enough helmets. The main things I wanted to find a home for first, was my 3D Wood helmet collection (which will always grow) and my full size refurbished helmets (also growing). For the 3D wood helmets, I found a nice spot for my 28 1980s helmets and then spread the other ones around other places as I made them. For my helmets, I used a technique that I saw on uniwatch years ago, where you simply just use cup hooks and hang the helmets by the ear hole. The technique was perfected by original helmet addict Derrick Dumont, who had one of the most amazing refurbished helmet collections ever, and partially my inspiration for doing my own. Of the 50 plus helmets I have in my collection, only one, that isn’t a vintage youth helmet, was not customized by me. Once the helmets were hung I added all of my other stuff and as it happens, I ended up having individual areas for specific teams. The Bills, Miami Hurricanes and Raiders were all given spots. Then as time went on my houston section grew and grew. The Sports Lair is always changing. As I add things, I have to move stuff around. Wall space is now at a premium and with more full size helmets to add, there is not much more room to add stuff. My fiancée , who is also way into football and sports, is okay with putting stuff in other rooms, but I’d prefer to try and keep as much as I can in the same space. There is no telling though, where it will all go and what new ideas I will come up with. I already have started filling up the stairway and will be filling up the currently blank space on the ceiling in the stairwell with my growing pennant collection. I’m not comfortable With Blank Space. Below is a gallery of how it progressed and how it is currently configured, well I actually have already changed things since, but things change quick down here in the Lair, hard to keep up. 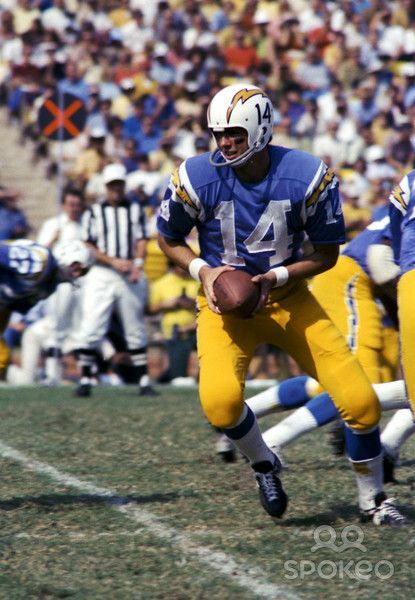 In 1974 the Chargers switch from their powder/lighter blue jerseys and white helmets, to a darker blue helmet. 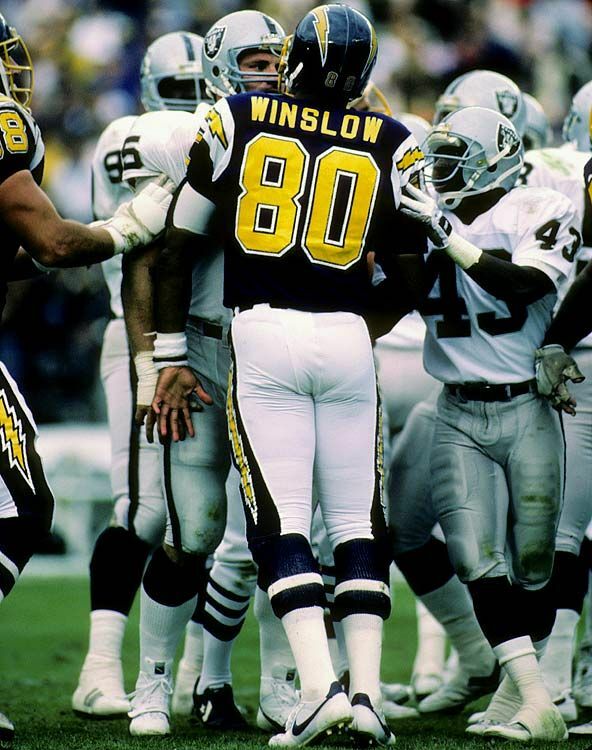 Now, I’m not always a fan of going to a darker color scheme, but I have always really liked the Chargers late 70s and 80s uniforms. 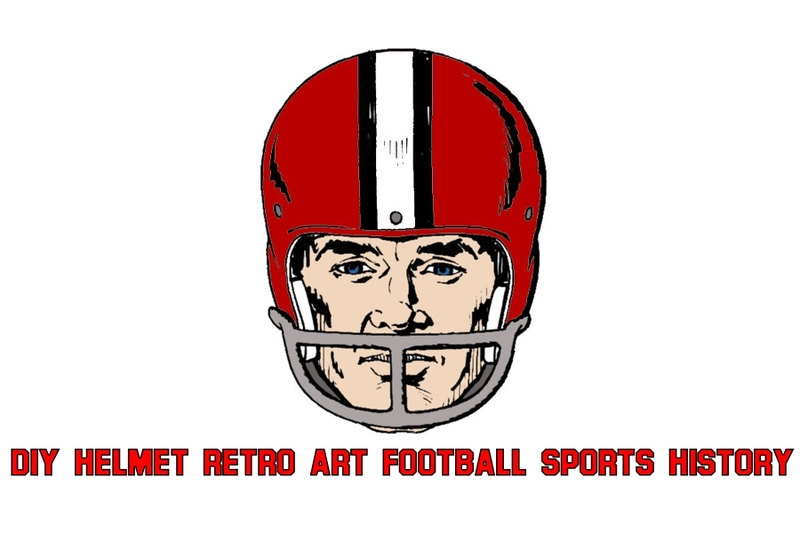 The special thing about these helmets, was that they were the first to include a team colored facemask. The yellow replaced the traditional gray masks that every other team had and started the trend of team colored masks that the majority of teams would wear through the present day, although many teams have switched back to traditional gray. Plus the navy over yellow look is one of my favorites, ever. 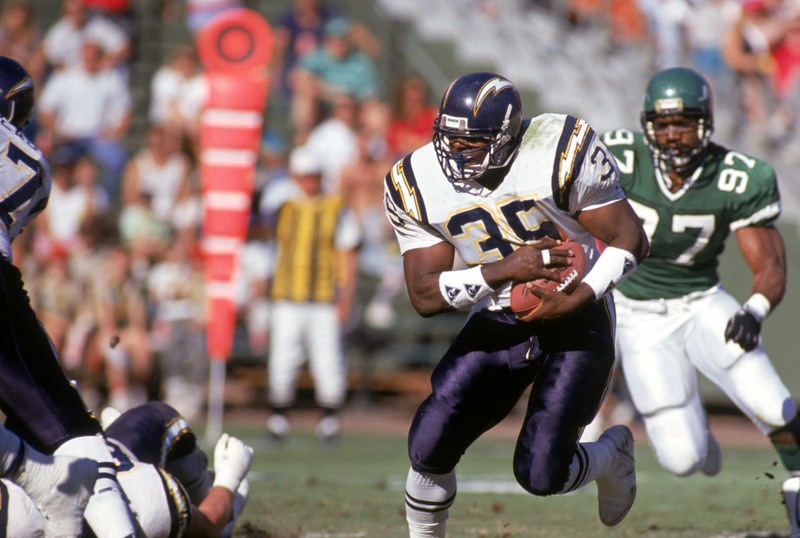 Don’t get me wrong, the Powder blues are amazing, but I also like the chargers other looks until they ditched the yellow pants in 1985 and later on added navy pants in 1990.